In this 15-lesson video course, we are going to take your endgame understanding to the next level. 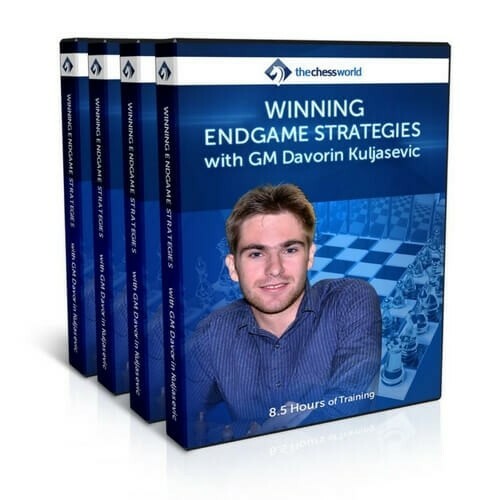 You will learn the specific and very effective methods that professional chess players use to achieve endgame mastery. Most club players only focus on two types of play: the attack and defense. You can often hear a phrase “if I‘m not attacking, I’m defending” and vice versa. By following this approach you are missing out on HUGE opportunity for saving and even winning some of the games you’ll otherwise lose. You probably already know what I am talking about: a Counter-Attack! A counter-attack is an insanely strong weapon. The main reason for that is the element of surprise it tends to deliver. Paired with the certain psychological moments of when an attacker turns into a defender, counter-attack can simply crush your opponents. Unfortunately, the majority of club players never employ this powerful technique. And it’s understandable… most coaches, books and training materials don’t even emphasize its importance. Simply knowing the basics of a counter-attack and applying them in your games will instantly change your potential as a chess player. IM Lilov understands the tremendous importance of the counter-attack. He compiled over a decade of experience into an easy-to-follow, yet very comprehensive 3-hour course revealing how to use this powerful weapon to maximize your results. By using IM Lilov’s approach you will be able to turn some of the “bad”, “unsound”, “passive” and even “losing” positions into draws and wins. Counter-attack is not magic. It is a pure science and a little bit of art. By learning how to counter-attack using IM Lilov’s methodology you will instantly turbo-charge both: your defensive and attacking skills. This course contains information that will change your chess forever. Time to get started!